From the autobiography of a saint which I just finished reading, I would like to share one of the scenes which has lasted longer in my mind than the rest. Yep, it is hell, and it is really frightening. Teresa of Ávila said that she was brought there for merely several seconds. 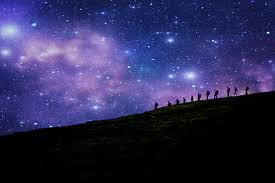 Can you imagine how will it feel to be there forever? It really made me want to go to a confession right away; but instead…well…I flipped through many pages of the book, kept reading… :) But seriously, I wish to stick this picture in my mind, to remind me everytime I seem to be falling into sin. Jangan lupa cantumkan button Scene on Three di dalam post dengan link menuju blog BacaanB.Zee. 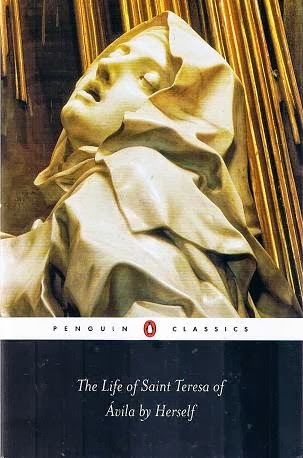 I haven’t read many autobiographies, so I was rather gambling when I bought this autobiography of one of the most famous Catholic Saints: Teresa of Ávila. Firstly because autobiography is usually serious; and this one, particularly, is religious. Tough combination! But I don’t know why, this one is tempting me since I put it in my WEM Project, and so….I dared myself to read it. In the end, it is so worth it! Although Teresa’s writing is not quite chronologic—she used to return to the past things related with the current issue that she might have forgotten, or which she thinks now is important, while is wasn’t then—and she seems to have difficulties to make things more clearly. But maybe this is because she had restriction (from God or from her superiors at that time). But above all, her autobiography is really inspiring. I usually do the three levels inquiries for WEM, but this time I go directly to review. I will still do the inquiries after this, though :). Now about the book…..
Teresa of Ávila (Teresa de Cepeda y Ahumada) was born at Ávila in 1515, into a family with good virtues, which I believe is the solid foundation of her own devotion to God in the age of six or seven. Her mother taught her to pray. Unfortunately, at age 14, Teresa began to lose her virtues through bad friends’ influences and amusements of the world. Scared that she might fall to sin, her parents took her to a convent, although with her bitterly aversion. The secluded convent seemed to bring back Teresa’s virtues, however she began to suffer from heart disease, and this forced her father to bring her out, and put her in her relative’s. 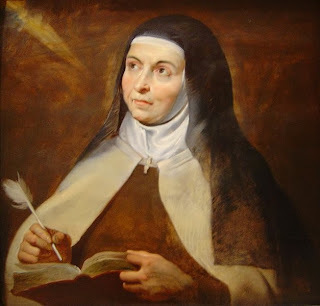 Teresa took the habit at the Convent of the Incarnation on 3rd November 1536, when she was 21 years old. Here she began to have great joy to serve God. Meanwhile, her health got worsened, and so she must be brought out of town for treatment, which unfortunately didn’t work as expected. It seemed that God deliberately sent the illness for her to endure, and she did endure it with patience. She was paralyzed for almost three years, yet she endured the great torment with joy. At this stage she regretted her former sins, and took St. Joseph as her advocate to God. However, once again she fell to sins because the convent provided too much liberty for a restless nun like her. One day Christ appeared before her, looking severe, telling her that her friendship with her current friend displeased Him. While she still disobeyed, God appeared in another vision. Teresa was weary of her sin, that she lost her previous joy in virtuous things. She abandoned her communing with God (meditation). Through her confessors’ guidance, Teresa returned to her prayers, but she still lived two lives: the earthly and the divine ones. But during those times, God never ceased to veil her sins from public, as He knew that Teresa, deep in her heart, always longed to serve Him. For twenty years Teresa fell and rose in her spiritual life, again and again; this state disturbed her, but thank God, He gave her courage to keep praying, because praying helps us to be nearer to Him, as He will bear so long for us to come to Him. Reading St. Augustine’s Confessions has helped her to incline more to spiritual graces and to stay away from things that did her harm. She taught us that there are four stages in prayer; the higher the stage the more intimate we would be with God. After 5 or 6 years exercising to 3rd stage of praying, Teresa was being accused and attacked by people who said that it’s only her innovations. She was disturbed by this fuss, and fell again to sins, until a Dominican Friar woke her up from it, and she realized how God is never tired to forgiving sinners. Teresa now often had an ecstasy, when God enraptured her. She was afraid at first whether it was not a deception from the devils, however in many visions and appearances God convinced her that it was from Him. God gave her favours in the raptures and visions; He even brought her to visit Hell and Heaven. The ‘tour’ to Hell was very horrible, that she couldn’t even describe it in words. Not only the tortures to body—she felt greater pain than she had ever endured on earth—but also the torture of soul, which was still much more painful than of the body. With these favours, Teresa began to incline to save souls, with the guidance from God. God commanded her to found a convent of St. Joseph’s. Through so many obstacles (that distressed Teresa so much, since, as usual, she was torn between God’s promise that everything would be OK as this was His wish, and her own thoughts that she was deceiving herself and others—which was clearly came from the devils), the convent was finally founded on 1562. During the process, Teresa received much opposition from others, including her colleagues and superiors, and even her confessors. However, as this was a work from God—and God was extra patience to convince the stubborn Teresa about it—the new convent was finally established. People opposed it because it was a reformation of convent’s standard system. St. Joseph’s convent took poverty as its main rule, and this they did not accept dowry from new members—as the standard of convents at that time—and strictly closed the convent from outer world so that the nuns could focus their devotion mainly to God. It really fitted Teresa, whose sins were mostly from her connection with the outer world. People who oppose Catholic and other Christian Church often attack us by saying: If God loves us, why, while we are so devoutly to him, that He let the devils tempt and attach us, that we must suffer much? Oh yes, God do let them do it, as I read from Teresa’s words. God allows the devils to do that to test our strength and to make us realize of His power to save us from harm. That’s why, we mustn’t retreat from our virtuous life when trials come, but strengthen it with more prayers and with humility. One important fact that astonished me is the powerful effect of Holy Water. Teresa told us that one day a devil appeared to her when she was praying; she was afraid, so she raised a cross to it, and it soon went away. However, a moment later it re-appeared. Teresa did the same action twice more, but the devil kept coming. So, Teresa reached for Holy Water, and sprinkled it to the devil, and this time it vanished and never returned. So great is the power of the Holy Water! There are so many valuable things I got from this inspiring book, a book which Teresa has written by the guidance of God. Teresa then submitted the manuscript to a Reverence to be published. She died on October 1582, but not before she founded many more St. Joseph’s convents (the Carmelite nuns). Forty years after her death, Teresa was canonized by Pope Gregory XV, and was named a Doctor of the Church by Pope Paul VI. Last but not least, here’s a lovely quote to help us all living this hard lives…. In fact, Teresa’s life was like that, she was not a perfect human being, but she kept loving God, did her best to please Him, and put her trust in Him. We are not perfect either, and we might not become Saints, but we can do our best to reach the eternal life as long as we put trust in Him to guide us. Four and a half stars for this autobiography, for although it is very inspiring, but so tough in reading, with the small fonts and Teresa’s inconsistent writing and sometimes full of ramblings. Right after reading few chapters of Kidnapped, I instantly saw the similarity with Treasure Island. The strange thing is, I totally forgot at that time that Treasure Island is also Robert Louis Stevenson’s adventure story! No wonder that those two are so alike, although Kidnapped is much more than just an adventure story. David Balfour is a seventeen year Scottish lad that has just become an orphan. It was at 1751, when Scotland suffered from the dispute between the Lowlander and Highlander (Jacobites). His dead father left him a letter and instruction to be brought to the house of Shaws, who appeared to be David’s uncle. Imagining that he was having a situation there, Ebenezer Balfour treated him badly; he tried to murder him but failed; then he conspired with a captain of a brig to kidnap David and sell him as a slave. All was done so that David could never touch his inheritance. David was a prisoner on board of Covenant, a brig of the villain Captain Hoseason and his gang. He saw the injustice and even a murder done by them. Fortunately, another ship wrecked, and a survived gentleman was taken into Covenant. The gentleman was a Highlander and enemy of the Campbell (King’s agent), called Alan Breck Stewart. Having overheard the Captain and the crew’s plan to murder Alan, David made an alliance with Alan to fight them back. Unfortunately the ship wrecked, and David, separated from others, was washed ashore in the inhabited isle of Earraid, where he cast away for several months, but then managed to return to the land. Reunited with Alan, David accidentally witnessed the murder of Colin Roy Campbell, and wrongly accused. So now, Alan and David, having come from different clan (David is a Lowlander) were now in the same ‘ship’. Through difficulties and dangers they both fled. And through this journey and adventure, an intimate bound of friendship was built upon David and Alan. The question is, how would it end, considering that they were supposed to be enemies? One most interesting aspect of this adventure story is the historical setting and facts. Many of the characters (especially those involved in the dispute of Lowlander and Highlander) were really exist in the history of Scotland, including Alan Breck himself. Through David’s eyes, Stevenson brought us to witness and learn one of Scottish histories during the Jacobite rising. Another strong point that makes Kidnapped not an ordinary adventure story, is the Scottish atmosphere that we’d find throughout the story. I was having difficulties of understanding many Scottish idioms and dialect in the first chapters, but along the way, I began to be familiar with it, and I think, overall, the Scottish nuance has added a unique value to this book. One thing (and an important one, at least for me) that didn’t fit my expectation is the ending. Adventure stories, just like mysteries, used to have a conclusive ending. Anyway, adventures’ pace is set such that it will reach climax at the end, and that—I believe—is the chief point of writing an adventure story. 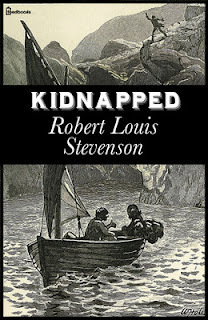 Unfortunately, Stevenson did not provide that conclusive ending for Kidnapped. I read elsewhere that there are two possibilities: 1) Perhaps Stevenson was worried that his ending might contradict the history; or: 2) Kidnapped was planned to be followed by a sequel; and thus the hanging ending was applied to curious the readers. There are so many plays I had wanted to read for this last freebie month of Let’s Read Plays; but at the end I picked George Bernard Shaw’s Saint Joan. And what a perfect choice I’ve made! I loved Joan, I loved the play, and I loved Shaw’s writing, right from the beginning. Shaw opened the play from Robert de Baudricourt’s farm, whose hens have been failing to produce any eggs for several days. His men believe that a maid who has been stubbornly stay there was the culprit. The maid is Joan—a peasant girl who asked Baudricourt to equip her with arms and suits, and send her to raise a siege in Orleans during the Hundred Years’ War. How can a seventeen year old girl want to go to a war? Joan isn’t an ordinary girl, for she is chosen by God for the mission. She claims to hear voices of St. Catherine, St. Margaret, and Michael the Archangel, that God has sent her. Something in Joan moves Baudicourt to provide what she wants, and right after that, a miracle happens, the hens laid eggs, and that convinces Baudicourt that Joan is indeed guided by God. Joan goes to the Dauphin, the young Charles who is waiting to be crowned. Joan wins Charles’ heart; she encourages him to send her to lead his army. He equips and sends her to the battle. In the battle another miracle happens after Joan’s arrival, ensuring Dunois—the chief commander—to let The Maid to lead the army. They win the battle, and Charles is coroneted as King Charles VII. 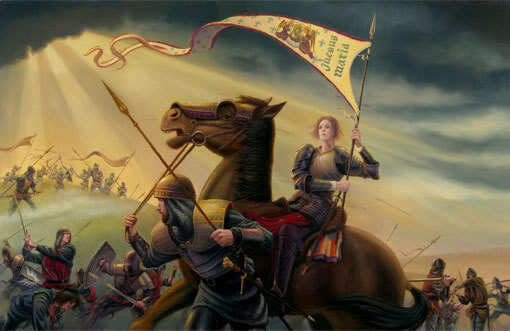 It’s from this battle that Joan is nicknamed The Maid of Orleans. Unfortunately, there are many people who dislike Joan’s conduct. 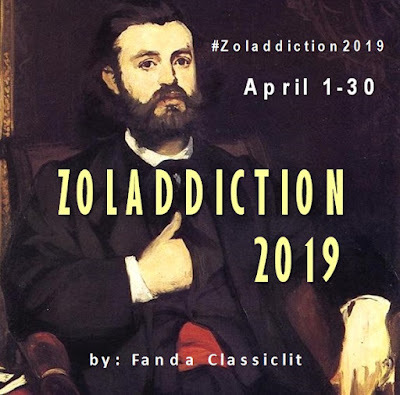 The landlords and the Church authorities have their own reasons to stop Joan’s mission, and so she is captured at last and brought to trial for heresy. As we all know, Joan was then accused of committing heresy, and burnt on the stake as her execution. However, twenty five years later a new trial was being held, which cleared the heresy accusation. Joan then canonized as Saint in 1920. Retelling a known history might not be an easy job, but Shaw has done it very beautifully. 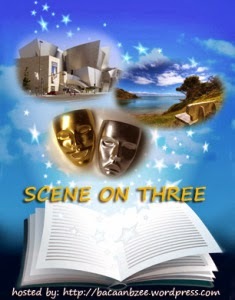 Although we already know the plot, it is very enjoyable to read the play. Joan’s warm, innocent, honest and blunt character is the soul of the play. She made us see what is needed to be God’s servants: humility. Because it is when we are free of personal ego, that God could fill our soul with divine things. The Church authorities in this play are busy with rules, gospels, laws, and doctrines, that they forget what is most important for the Church, that is God’s voices. It is instead in an ordinary peasant girl that He pleased to grant it: Joan. Although she is only a peasant girl, and never had the opportunity to learn theology or things like that, Joan could match the Chaplain, Bishop and Archbishop’s arguments when debating about God’s voices. For Joan, God’s will is above everything, so no matter how strange His instruction is, she would follow without asking. The intellectual men, on the other hand, are proud with their knowledge and ability, that when they see something they don’t understand, it obviously comes from the devils. Five stars for Saint Joan, and it made me want to read Shaw’s other plays. You can also read my deeper analysis of the play here and here. This is the second level inquiry I am working on for WEM project. The first one is here, and this would be the last stage I’m going to post; I must skip the third level for all plays because it requires us to re-make the play in our own style (I don’t think it necessary for me; and I don’t have time for that either). It’s given unity by faith, or in this case, by lack of faith. It is all, from the beginning, about how people think about what/who had led Joan to do what she has done. Was she inspired by God, or by the devil? Was it heresy or God’s act? And in the end, did Joan deserve to be accepted as Saint? So, I think it’s all about faith. Joan stands for simple minded people who only hold on God’s will, and put God above all. It is the simple-mindedness which can accept divine idea. The Church authority (Bishop, Archbishop, Chaplain) stands for proud people in higher position who praise themselves as the most powerful servants of God, and thus their opinion are certainly those of God. They put their own pride over God, and that’s why God didn’t reveal the divine truth to them. Joan’s friends (Charles and Dunois) stand for people who take God seriously only when He would grant their wishes. Charles and Dunois both believed in Joan because they have seen the miracles which answered their prayers. When the same God (through Joan) asked them to do more fight, they were reluctant because they no longer needed His help. They only want to take but refuse to give. Yes, in the case of Joan and the Church authority, as above mentioned. The Church authority here reminds me a lot of the Pharisees, they both had misconception about being faithful to God. Here I only pick two characters that are most contradictory: Joan and the Archbishop. Joan’s words show that she is a simple and honest girl; she speaks boldly and innocently, but always full of virtues. Exp: [her eyes skyward] “I have better friends and better counsel than yours”. No; and that’s what makes this play was categorized in tragedy. The real tragedy is not because Joan was burnt to death (for Saints, death is just the mean of being united with God), but because after what had happened, people still could not accept their Saint. That is the real tragedy! I think Shaw wanted to criticize how difficult it is for humankind to understand God’s will and to accept it humbly. From the beginning of the play, people got to believe in Joan only after they saw some miracles done; a proof that justified what was told them (Thomas all over again: ‘Unless I see in His hands the print of the nails, and put my finger into the print of the nails, and put my hand into His side, I will not believe’?). And from the Church authority we see that knowledge often veiled soul to understand the real truth; that God’s divines can only be seen with simple and humble heart. Today’s scene is picked from one of George Bernard Shaw’s plays: Saint Joan. Joan is a peasant girl in France who became a French soldier and fought against English army in the Hundred Years’ War as a divine mission from God. People didn’t believe at her at that time; she was taken as committing heresy, and being burnt for it. However twenty years after, the trial was declared as corrupted. She was then canonized as Saint in 1920. This particular scene was after Joan has won Orleans from the English, and made King Charles finally being crowned. God led her then to fight Paris, but the French (the commander, the Archbishop, and even the King) opposed this plan. Joan was left alone in her action, and this was her speech. As always, faith made one much braver than him/herself, because they do not act alone, God is with them; they know it and have faith in it. Joan is a peasant girl, but she is much braver here than the rest of them. It’s because she has something they don’t: faith in God. She might be alone, but she is actually never alone, for God be with her. That’s the kind of faith we must all have. Bab 2 Kitab Yesaya membicarakan dua hal: nubuat tentang “kerajaan damai” yang akan datang, sekaligus kecaman dan hukuman yang disediakan Tuhan bagi orang yang meninggikan diri. Yesaya menubuatkan bahwa pada jaman akhir, manusia akan berpaling dan berbondong-bondong menuju ke “rumah” Tuhan, karena disanalah akan ada kedamaian yang sesungguhnya, di mana takkan ada lagi kejahatan dan permusuhan. Pada ayat 4 ada ungkapan yang indah untuk menggambarkan kondisi itu, di mana pedang akan ditempa menjadi mata bajak, dan tombak akan menjadi pisau pemangkas. dan sebagai apakah ia dapat dianggap? sebab mereka akan diperlakukan menurut perbuatannya sendiri. 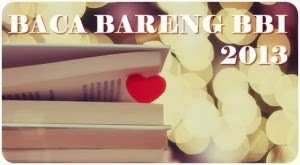 Mereka telah menyesatkan bangsanya sendiri, maka sekarang malapetaka menimpa seperti berbuatan mereka, yaitu berupa kekacauan yang melanda bangsa itu. Hukuman yang menimpa wanita-wanita Sion yang rusak moralnya juga unik, yaitu dengan mengganti rempah harum menjadi busuk, dll. Bab 4 memiliki keunikannya sendiri juga. Pertama, karena dalam 1 bab ada dua kondisi yang berkebalikan. Ayat 1 menggambarkan puncak kemalangan bangsa Israel, yaitu sampai-sampai tujuh perempuan akan memaksa satu laki-laki untuk memperistri mereka, menunjukkan begitu menderitanya mereka karena hukuman Tuhan. 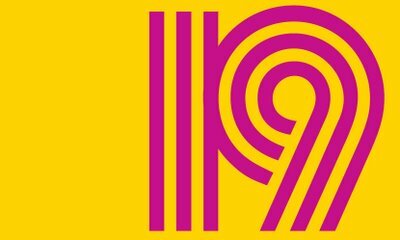 Lalu, tiba-tiba pada ayat 2 ada perubahan tema. Di sini digambarkan bagaimana umat Israel yang terluput dari amarah Tuhan akan mengalami kekudusan dan selalu dilindungi Tuhan. Keunikan kedua, adalah, bila dari awal bab 1 s/d 3, penulisan nubuat Yesaya selalu dalam bentuk puisi, maka khusus pada bab 4 ini bentuknya beralih ke prosa. Aku membayangkan saja….mungkin Yesaya mengalami penglihatan yang sangat intens dan menggetarkan; begitu mengerikan, sekaligus begitu kudus, hingga ia langsung menuliskannya apa adanya. Ini hanya interpretasiku saja…. Thanks to my friend Maan Kawas, I could watch this movie via youtube. This is the old version of Chekhov’s The Cherry Orchard movie adaptation; 1981 BBC video of four parts miniseries, directed by Richard Eyre, where Judi Dench plays beautifully as Madam Lubov Andreyevna Ranevsky. This movie would not be as strong as it is without Judi Dench’s acting. She can play convincingly as Lubov; she is everything I can imagine about her. She can pull out the emotion very well. In short, Judi Dench is the center of the stage whenever she is on it. 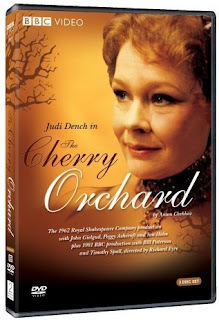 What’s more interesting is that about twenty years before, Judi Dench has also played in another The Cherry Orchard movie version, but at that time she played as Anya. Lopakhin is also quite convincing here; as a slave boy who has been climbing as a successful businessman, and who—deep in his heart—always keep his ambition to ‘beat’ his ex master. Bill Paterson plays well the cunning Lopakhin. But I think his gesture when announcing that he is the new owner of the house is a bit overacting. It might be good on stage, but in the movie I feel it doesn’t fit the whole scene. I think Frances Low is too old to be Dunyasha. Is she really that older from Yasha? As with most of BBC classics miniseries, the plot of this one is following the book’s very precisely, so, no complain about that. One thing that is less satisfying from this movie is the setting. It seems that BBC is quite confused whether they’d make The Cherry Orchard into a movie or perform it on stage. The house is OK, but the garden (or is it actually part of the cherry orchard?) is too plain. I know it is a bit difficult to perform it outdoor; it is OK to have a set decorated as an outdoor, but you must decorate it such to look like real. And it would be great if we can take a glimpse of the cherry tree, if not the whole orchard, at least the tree(s). Just like the plot and setting, the costumes follow the book precisely. My favorite is Lubov’s, they make Judy looks elegant (but I think it’s more of Judy’s, not the costumes :D). Anya’s is a bit old fashion for her character, but considering how she’s changed her mind about the cherry orchard after conversing with Trofimov, I think it makes sense that she dresses plainly, leaving the glamour behind. Overall, I rated this adaptation 7 to 10. From the beginning everyone has been wondering whether Joan told the truth when she said that God sent her. In these cases, one always wonders whether someone is a saint or a liar. So, the initial question here is: Is Joan really sent by God? It only points out what the most important thing for human kind should be. The speech is so eloquent that it touched me deeply when reading it. At first I picked Joan’s burning as the climax (the Chaplain and Ladvenu repented here), but after thinking it thoroughly, I decided that the real climax is Joan’s canonization announcement as Saint. Because off this canonization process, do the others really admit and honor her by kneeling to her giving praises. What else could be more climax than this? When everyone who had been under-appreciating her and accusing her now adore her? In King Charles’ dream, where he meets Joan and all others; they deserts Joan one by one to the idea of her resurrection, right after their praises to her. To which Joan sighs to God: “O God that madest this beautiful earth, when will it be ready to receive Thy saints? How long, O Lord, how long?” I believe Joan’s desperation is the resolution. I think what makes it difficult for people to see the truth behind Joan’s claim that she is sent by God, is the lack of faith. That is what holds the play’s action together. People choose to believe what they can understand, and take anything beyond imagination as heresy or witchcraft. Even after they are proved to be wrong, it’s still difficult for them to accept their saints. 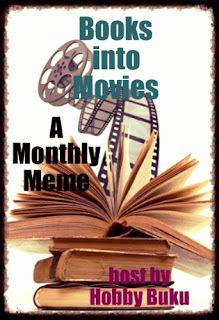 Saint Joan is a play from George Bernard Shaw I picked for the last freebie theme of our Let’s Read Plays. I am also working on this for WEM Project, and as usual, this is the Scenes summaries (not Acts, as it contains only Scenes). Joan—a peasant girl—was told by God (through St. Catherine, St. Margaret and the Blessed Michael) to go to Robert Baudricourt, a landlord, to ask for soldiers to drive the English away from Orleans (France). Skeptical at first, Robert could not reject Joan’s proposal and finally granted it. Then a miracle happened, which ensured Robert that Joan was sent by God. Joan came to the Dauphin (the young King to be crowned) Charles the Seventh, but the Archbishop rejected to see her. Charles was weak, but he’s impressed by Joan as she had done miracle by guessing the real Charles while he was in disguise. 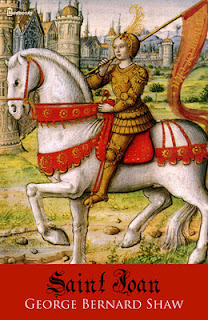 Joan convinced and encouraged the weak Charles to let her led the army and crown him King. At Orleans Dunois is the chief commander, and for days he couldn’t across the river to get to French army because the wind always blew to West. Joan arrived, and miracle happened, the wind suddenly blew to the East. Dunois believed that she—The Maid—was sent by God, and though he reluctantly at first to give the army command to Joan, he did it after the miracle. In English camp, English Earl of Warwick and Rev. de Stogumber met Bishop Mgr. Cauchon; the first two insisted that Joan was a witch and must be burnt. The Bishop cared more about the girl’s soul salvation than politics, but saw her as a heretic from Devil. Earl of Warwick worried that the aristocracy would lose their power from the King if he be coronated. In the Cathedral of Rheims when King Charles has just been coronated, Joan wanted to fight Paris before she returned home; but the others rejected the idea. They even threat her that she could be burnt for heresy. She was now left alone by others whom she had helped, but she put her trust in God. Joan was captured and being tried for heresy. With some tough disputes between the politicians and the Church (English partisan) during the trial, Joan was nearly freed from charges. 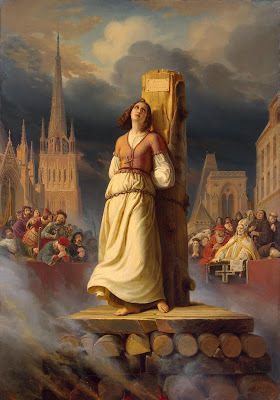 But after knowing that she would be imprisoned till death, she chose to be burnt at stake. A cross was brought before her when she was dying. Twenty five years after Joan’s death, King Charles was visited by Joan in his dream, along with most of the main characters. 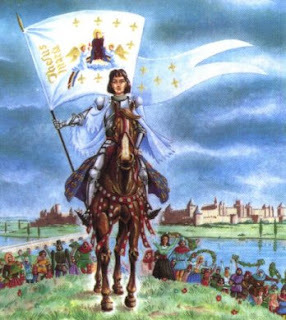 That day, Joan canonization has been decreed after a trial being conducted and the heresy trial has been proven corrupted. The others confessed that they finally realized that Joan comes from God, not from evil, but when Joan was suggesting whether she’d better come to live again, the others soon left her; and Joan could only sigh to God, how it is difficult for men to receive their saints. Orsino—Duke of Illyria—is wooing Olivia, a lady who is in mourning of her death brother and doesn’t want to meet any man. Meanwhile, Viola—also a lady—is stranded in Illyria as her ship wrecked, separated from her twin brother who was at the same ship before the wreck. She wants to hide her identity, so she disguises as a man and serves as Orsino’s attendant, Cesario. 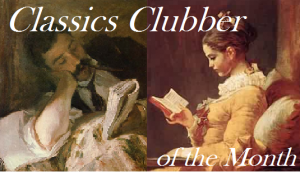 As she becomes the Duke’s favorite, Orsino sends her to woo Olivia for him, which is hard a task for her as she is actually in love with her boss. The plot becomes much more complex when Olivia rejects the Duke but falls in love instead with the messenger (Viola in disguise). Meanwhile Sebastian—Viola’s twin brother—has actually landed on Illyria too; and as he is Viola’s twin brother, it’s hard to distinguish one from another; and that adds to the complexity of the misunderstandings. 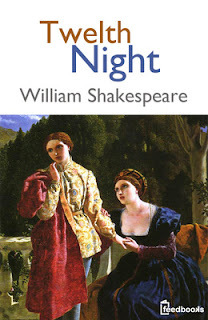 As always with Shakespeare’s comedies, this play is about misunderstanding, disguising, and coincidences. There are the ladies and gentlemen, but also the losers (Sir Toby Belch and Sir Andrew Aguecheek), and of course The Fool who is often cleverer and wiser than the others :). I’m not a fan of comedy, but this one was quite enjoyable as a light reading. However, I still cannot appreciate some vulgar humors of Shakespeare (and maybe I’d never do) in this play. One character that annoyed me is Maria. The way she’s playing at Malvolio is, for me, too much. Maybe Malvolio deserves to be given a lesson by his colleagues for his haughtiness, but to false your boss’ handwriting to insult your colleague is ‘grossness’—the word Maria used to describe Malvolio’s appearance: “For there is no Christian that means to be saved by believing rightly can ever believe such impossible passages of grossness. He’s in yellow stockings.” And why must she use Christianity to compare such silliness? Ridiculous and not funny at all! Three and a half stars, for I enjoyed the play, although it’s not too special. P.S. I still don’t understand, why this play is titled Twelfth Night? 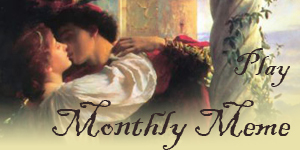 Are the scenes really stretched in twelve nights?